PaintScratch sells Subaru Touring Wagon touch up paint for the years listed in the table. Click your Subaru Touring Wagon year to see available touch up paint colors. We guarantee Subaru Touring Wagon touch up paint will match the original factory color chip on Subaru’s manufactured after 1985. Order Subaru Touring Wagon paint pens, brush cap bottles, and spray cans from our secure online store. For small Touring Wagon scratches, the paint pen works well. For slightly larger Subaru Touring Wagon scratches and chips, a brush bottle is best. For larger paint repairs, a Subaru Touring Wagon spray paint can will deliver best results. Touch Up Paint Videos - Watch and learn how to apply touch up paint to your Subaru Touring Wagon. How To Apply Touch Up Paint - Detailed instructions for using automotive paint on your Subaru Touring Wagon. Subaru did not make it easy to find the color code. 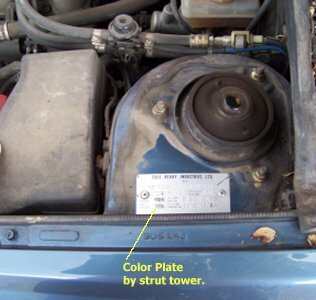 For some reason, they sometimes put the color plate on top of the drivers side strut. Now, this is a ridiculous location but so it goes. In recent years, they have become more reasonable and put the color plate in the driver or passenger side door jambs. 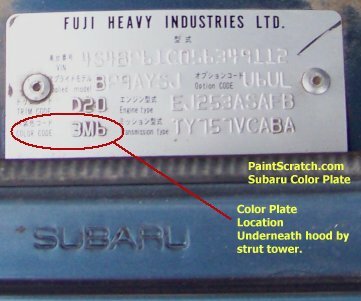 Typical Subaru paint codes are three digits long and composed of numbers and letters. Granite Gray Opal Clearcoat	35S". If your car has two colors, you will see the two tone color code. When you look on our site at your year, make and model, you can see a listing of the two tone color codes and the corresponding paint colors. Subaru, like all manufacturers, uses the exact same color across many models and then will have a different color name for each model. It's the same paint! This is why the color code is so important to order the correct paint. Lombard , IL "Thanks Collin every one in the club says you are the best and you really do stand behind your word. Thanks"